Plano Texas is blessed with many homes with beautiful landscapes. It is very common for Patrick Wilson, owner of Empire Landscaping to receive calls from homeowners who like, but don’t love their front lawn landscaping. They wonder if Patrick can offer anything unique and cost effective to help them. Luckily, Wilson is always up for the challange. 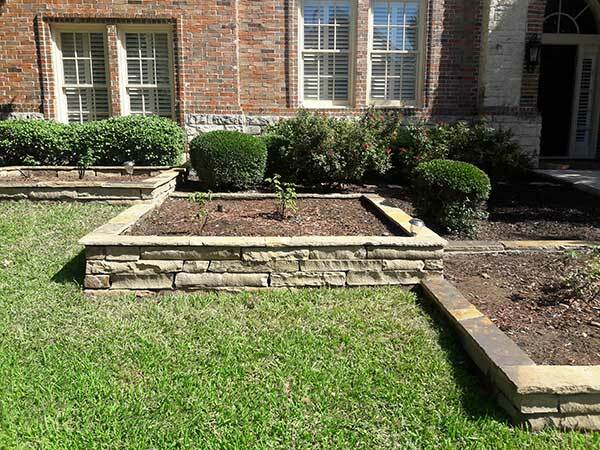 This month, Empire Landscaping received just such a call from some Plano homeowners. They had a nice, but nondescript front yard that sloped from left to right. They liked the idea of raised beds to add some vertical visual anchors to help frame the home but were not interested in typical manufactured “blocks” that you see at most big box home centers. Patrick presented some options for consideration and the family selected the Oklahoma Chopped stone. This is a natural stone quarried in Oklahoma, hence the name. Once quarried, each stone is cut or “chopped” to relatively uniform thickness and varying lengths. Because of the uniformity in thickness, Patrick was quick to recommend dry stacked beds. Dry stacking allows the homeowners to avoid grout lines and plays on the theme of natural products in natural surroundings. And, Patrick installed the beds on a diagonal bias to add another visual element to the home. The raised beds make a great backdrop for adding greenery and lighting of your choice. Homeowners often use these for seasonal “pops” of color to accentuate their home. Need some ideas on changing your landscaping? 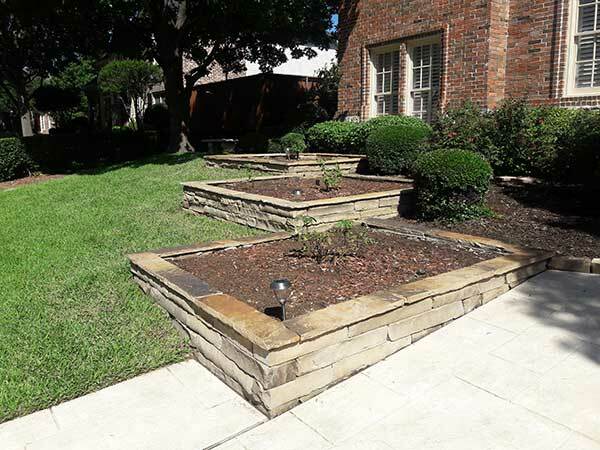 Contact Empire Landscaping today for a fast professional consultation and the best service around Dallas.